The senior surviving leader of Cambodia's Khmer Rouge regime has appeared in court to appeal against his detention by a genocide tribunal. Nuon Chea, who faces charges of crimes against humanity, requested bail on the grounds he was not a flight risk. The hearing had been delayed from Monday by a row over his legal team. Nuon Chea was deputy to Khmer Rouge leader Pol Pot, under whose brutal four-year rule more than one million people are believed to have died. 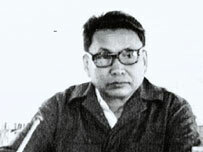 Experts believe Nuon Chea was the ideological driving force behind the regime and responsible for its most radical policies. The octogenarian is one of five top Khmer Rouge officials who have been charged by the UN-backed genocide tribunal. Trials are expected to begin later this year. 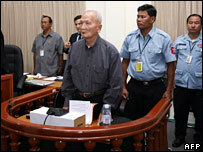 Nuon Chea told the court that he should be released on bail to await trial. "I have no desire to leave my beloved country," he said. "No-one is worried about my security." A decision from the court is not expected for several days. A similar appeal by the head of the Khmer Rouge's notorious Tuol Sleng prison, Duch, was turned down in December last year. The BBC's Guy Delauney, in Phnom Penh, says that the tribunal is of great symbolic value, giving survivors of the Khmer Rouge era a chance to have their say. Four survivors have been registered as civil parties to the case and have the right to address Nuon Chea in court. It is also, our correspondent adds, a chance for the tribunal to show that it is working. The process has been dogged by a series of problems. On Monday, Nuon Chea's hearing was adjourned because the Cambodian legal authorities had refused to register his Dutch lawyer. There are also financial difficulties. The courts are running out of money and international donors need to be convinced that extra funds will be well spent. Many Cambodians fear that the regime's ageing leaders may never face justice. Pol Pot died in 1998.